Make waves this holiday season with a deluxe mermaid tail set featuring our best-selling Tidal Teal design from the Mermaidens collection! Our special Gift Set includes swim top and fun extras! You’ve been waiting for the right moment to buy your little mermaid fanatic a mermaid tail set of her very own. Why not choose this special holiday bundle to enhance her mermaid experience? 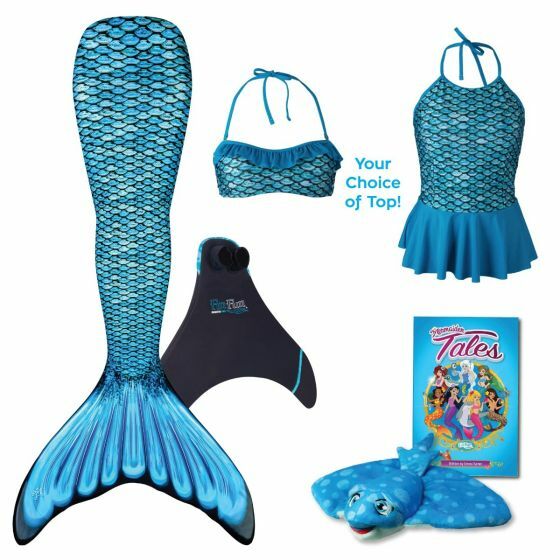 In addition to a stunning mermaid tail skin and swim monofin, she’ll also receive a matching swim top (in a bandeau or tankini style of your choice) plus a book and plush toy to flip her fin over.